Seasoned remodelers, BJ and his wife Jodi weren’t planning on purchasing another home. It wasn’t until their realtor introduced them to the quaint 1939 Cape Cod style home a few miles away that they decided to make the move. They knew it needed work, but fell in love with the neighborhood, the lot, and the charm of an older home. It had so much potential in becoming their own. Construction weary yet intent on making it work, they decided to split their remodels into phases making it a little easier on their home living during the process. 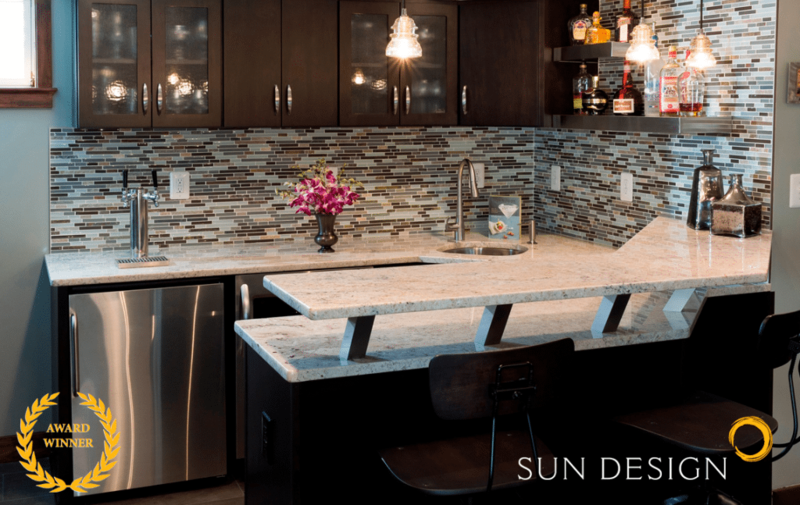 When a friend gave them a pool table for their basement, Phase 1 and Phase 2 swapped making the basement priority over the kitchen, and they began their hunt for the right builder. Completing the space for their pool area, a bar was designed and crafted for their basement. 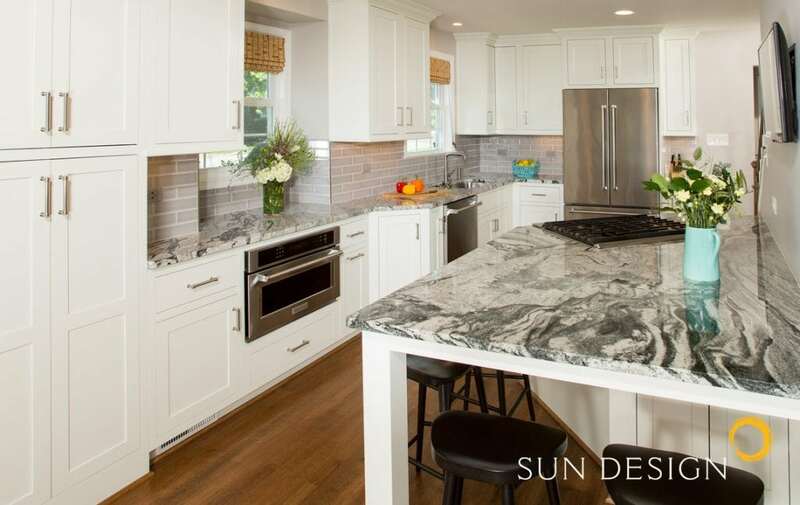 In 2016 it was recognized for its creativity in terms of storage, craftsmanship and design – highlighting the two-tiered granite countertop – with a Grand ‘level’ Contractor of the Year [CotY] Award. “The previous homeowner had done some handy work throughout the house, and all of the bathrooms on each floor were completely identical. 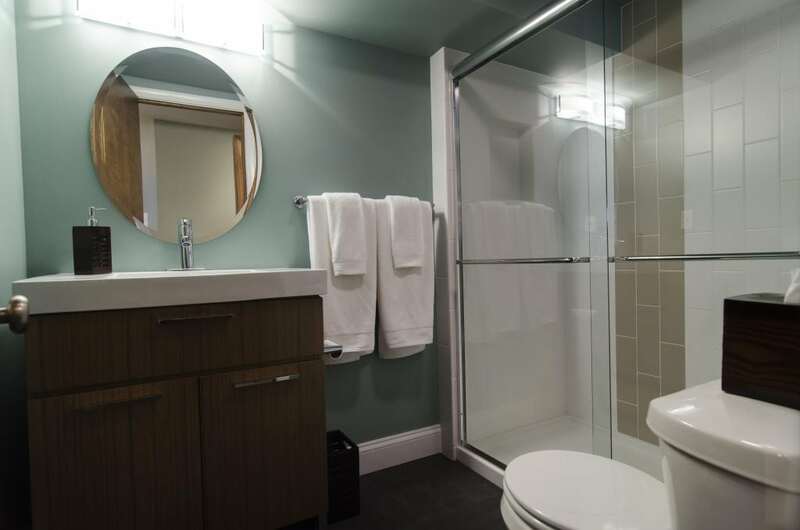 Same toilet, same mirror, same linoleum flooring, same everything!” In completion of Phase 1, the basement level bathroom was updated to accommodate the clients personal tastes and overnight guests. Two years later Jodi and BJ brought their trust and faith back to the Sun Design team, ready to begin phase two of their home remodel: the kitchen. With the previous homeowners modifications throughout the main level of the home, it wasn’t clear why or how things were done the way they were on the main floor. The flooring wasn’t continuous throughout the main living space; beams and structural points weren’t easy to identify; bulkheads left the ceiling bumpy; the basement entry way was only a few feet in from the front door. Walking through the home with the homeowner as if going through ‘a day in the life of’, the space was dark and the rooms cut off from each other. Within such a small footprint, the interactivity of the space was heavily underutilized. “We were only living in two rooms on the first floor.” Jodi said. Jodi and BJs residence is more than a home for them – it’s a home for their neighborhood. They have neighbors at their home several times a month and want their home to feel like a welcoming place for everyone to stop by and enjoy their company. 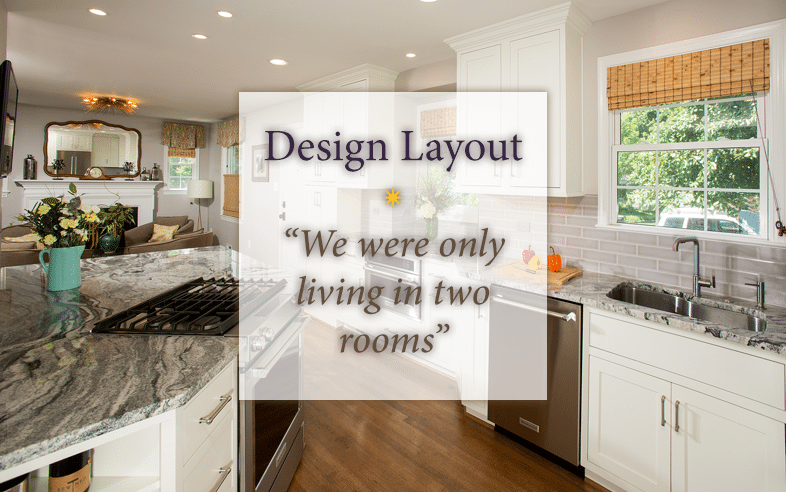 Keeping this sense of welcoming presences, several layouts for a new kitchen and main living area were drafted during their design phase and they settled on the most spacious and cohesive layout for their lifestyle. Phase two of their remodel included opening their staircase to the upstairs, changing the entry place of their main-floor bathroom and updating it, and opening walls from the kitchen to both the living and dining rooms allowing more natural light into the center of their home. When asked about visitors Jodi shared, “neighbors often compliment the general ‘good vibe’ of the space and compliment us specifically on the selections and craftsmanship.” Even more seasoned now in what they like and how they care for the artistry of their home, they enjoy day-in and day-out the charm of having an older home enhanced through superior workmanship and devoted talent.